Safe is boring! You were created to create! Be creative in this advanced pattern making Course for Couture and High Fashion. Register for this Course now and be the fashion leader you were born to be! We were created to create and be creative! Learn the fascinating art of 3D Patternmaking, Origami and Transformational Reconstruction and create wearable art for ready to wear and made to measure clothing. This amazing Course will open your mind to the endless possibilities of design and how to apply them to create your unique style. 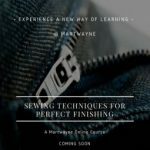 This Course introduces patternmakers to geometric and structural forms of pattern cutting, how to add texture and structure to their designs to give a wow effect to every piece of clothing produced. Ever been wowed by clothes on the Runway and clueless on how to create those amazing designs?! Register for this Course today! We embrace innovation, it’s at our core. We always put our students’ needs first – we go the extra mile. Welcome to the Month of July…. To the End of a Successful Debut Module! © Martwayne | Fashion School All rights reserved.